The new issue of Studies in American Naturalism is available at http://muse.jhu.edu/issue/36848. 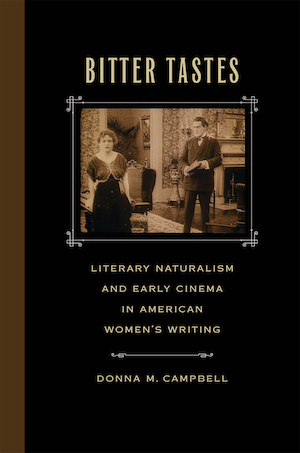 In addition to fine articles, it includes Linda Kornasky’s fine review of Bitter Tastes: Literary Naturalism and Early Cinema in American Women’s Writing (thanks, Linda!) and my review of Anne Boyd Rioux’s Constance Fenimore Woolson: Portrait of a Lady Novelist. There’s also a great review by Sheila Liming of Meredith Goldsmith and Emily Orlando’s Edith Wharton and Cosmopolitanism (for which I wrote the Foreword). Donna Campbell’s substantial new study introduces a unique perspective on American women writers of literary naturalism. Campbell proposes that “placing women’s naturalism at the center rather than the periphery of the [naturalist] movement reveals an ‘unruly’ counterpart to the rules of classic naturalism” by Frank Norris, Theodore Dreiser, etc., which, she contends, “expresses an interest less in philosophical consistency in its treatment of determinism than in the complex, sometimes uneven workings of social forces that operate on female characters constrained with the extra complications of women’s biological and social functioning” (4). This alternative, re-orienting perspective suggests, nonetheless, that new attention should be paid not only to “unruly” naturalism written by women often overlooked in naturalism studies, but also to texts written by men usually not included there. Moreover, Campbell brings turn-of-the-century and early twentieth-century film into her study, paralleling naturalism and early film’s emphasis on visual “authenticity” (11). Anne Boyd Rioux opens her excellent new biography of Constance Fenimore Woolson with two indelible images that are the sum total of what most readers know about the author: in the first, “a woman jumps from the third-story window of her Venetian palazzo”; in the second, weeks later, a distraught Henry James sits in a boat in the middle of a Venetian lagoon, trying helplessly to submerge both the dresses and the record of their friendship, but the dresses “billow up like black balloons” (xiii). Unlike the dresses, Woolson’s critical reputation has been less than buoyant in the century since her death, although an edition of her complete letters (Complete [End Page 88] Letters of Constance Fenimore Woolson, 2012), numerous book-length critical studies and articles employing feminist approaches, and Rioux’s new collection of Woolson’s stories should do much to restore her reputation. Rioux’s carefully chosen title, Constance Fenimore Woolson: Portrait of a Lady Novelist, signals this revival and Woolson’s struggle for acceptance, for it echoes James’s Portrait of a Lady, the work of an author whose reputation has shaded if not entirely effaced Woolson’s own in literary history. “Lady,” too, is particularly apposite, for Rioux’s running theme is what the literary world might have made of Woolson had they treated her as simply a “novelist” without the diminishing modifier “lady.” The book is thus a twofold portrait, not only of Woolson but of the literary world of high-culture magazines and publishers in which she found success but struggled to create a kind of writing that relied neither on the prosaic lack of idealism, as she saw it, in Howellsian realism, or the bloodless analytics of Jamesian psychology. Figure 1. EW was as poised in her letters as she is in this photograph. After reading so many letters to as well as from Edith Wharton last month at the Beinecke Library, I had a few thoughts, not all of them reverential, on writing letters to Edith Wharton. First of all, her letters are a joy to read because her command of the language is–can I say perfect? Even if you can’t make out a word at first, you know that the sentence is grammatical and that the defect lies in your ability to read her handwriting, not in the letter itself. This is immensely helpful in deciphering the letter and also an inspiration to the rest of us, who’ll then resolve to write more gracefully. But suppose that you’re one of her contemporaries, and you want to write a letter to her. What then? If you’re a close friend or family member, you’ll know the right tone to take, and the exchange will be friendly, funny, and great to read. If you’re an editor with whom she has a good professional relationship, such as Edward Burlingame or Rutger Jewett, you can expect friendly and witty letters as well as the immemorial authorial complaints about sales and advertising and the number of periods to use in an ellipsis. Let’s just say that Mrs. Wharton and common sense do not agree with current recommendations from the Modern Language Association. Figure 2. Lily Bart might have been marginally safer with Orangeine than chloral hydrate, although it, too, could be deadly. If you’re a random fan, she might keep your letter, as she did the one from the president of the Orangeine Company, who was delighted to see her mention the product in The House of Mirth and in effect offered her an endorsement deal, if I remember correctly. Needless to say, she didn’t comply. If you’re trying to get her to address your book club, autograph a copy of a book, give her an award (except the Pulitzer Prize), give you a few pithy words explaining her literary philosophy, or any of the other requests that famous authors must get by the thousands, the answer is no. You might get a frosty but polite letter back from her secretary, roughly as follows: “Mrs. Wharton never speaks in public,” “Mrs. Wharton has made it a rule to reserve autographs for her close friends,” or “Mrs. Wharton appreciates the honor but is unable to attend,” etc. If you’re a member of a literary rights agency such as Curtis Brown, most of the time you will have to address your correspondence directly to “Mrs. Wharton,” but all the letters you receive will be from her secretary and will begin “Mrs. Wharton begs me to remind you” or another such phrase. In other words, you have to talk directly to her, but she responds through a secretary–which, if you think about it, makes sense given the constraints on her time. If an underling or someone unfamiliar with Wharton slips and addresses her as “Miss Wharton”–you will certainly hear about it, and not in a good way. I’d love to have been a fly on the wall when Mrs. Wharton read this one. Opening paragraphs of “Edith Wharton’s Two Worlds,” the Humanities Fellowship talk I gave last night. To begin this talk, I’d like you to imagine a time when the United States, one of the wealthiest and most powerful nations on earth, was not so much one nation as two. It was a deeply divided country economically and politically, with millions of families living in rural or urban poverty while the wealthy paid little or nothing in taxes and lived in the utmost luxury. In this time you’re imagining, workers were driven from their jobs by increasing mechanization and by anti-union and anti-strike actions that spilled over into violence. Lax regulations on manufacturing meant that industries could pollute air and water and that workers would receive little or no compensation for their injuries. Families lost their homes and were forced into poverty and onto the streets by the financial shenanigans of the corporations who bought off state and federal legislators to ensure that government regulations, such as they were, would never touch them. In this imagined time, there was rampant prejudice against immigrants from the east, who were deemed suspicious because of their “foreign” religious practices and fears that these immigrants would owe allegiance to the head of their religion rather than to the United States. Unrest in their home countries also meant that many immigrants were branded as politically volatile and prone to violence and terrorist acts. In addition to conflicts over religion and immigration, in this imagined America Anti-Semitism was common, expressed at the highest levels of society, and enforced through restrictive covenants in housing and quotas to limit the numbers of Jewish students who could attend private universities. Racism was on the rise, including incidents of violence, and state legislatures in the South devised restrictions that made it harder for African Americans to vote. Goaded by the media and by strong celebrity personalities who used emerging media to stir up and unify their followers, white nationalist parties, some previously dormant like the KKK, gained legitimacy and power, playing on fears that immigrants would steal their jobs and change the character of the nation. And in this imagined America, the position of women was not equal to that of men: they were barred from many occupations, discouraged from pursuing higher education, made less money than men, had no legal access to birth control and abortion, and were subject to abduction and sexual slavery. This imagined America may seem familiar, even contemporary, but the world I’m talking about is that of Edith Wharton (1862-1937). Should you be required to join Facebook to see public history posts? Maybe this happens to you: you’re taking a break and looking at Twitter, and you see a tweet about a Call for Papers or an interesting history post. So you click on the link, and you get the screen above. Are these public posts? No, they’re private ones, behind the wall of Facebook. Just because Facebook is widely used (yes, I have an account, too) doesn’t mean it’s an open source for information. Sure, you could log in, if you don’t care about having your interests and clicks and data measured, which I don’t especially on FB. That’s the Mephistophelian bargain you make when you sign up for Facebook; as the old saying goes, if you’re not paying for the product on the internet, you ARE the product. It’s one thing when the Association for Cat Necklace Distributors or some such thing wants to keep its organization behind the Facebook wall. But when it’s supposedly public information? Or a supposedly open scholarly society? That’s irritating. So if you see me retweeting, with an open link, the closed information and calls for papers that pass through my Twitter feed, that’s why.